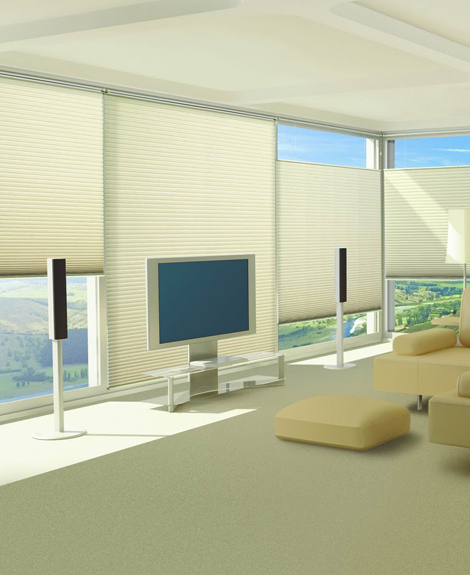 These dark honeycomb shades are the ideal way to block light and solar heat, making them both energy efficient and budget friendly. The crisp pleats enhance any room's décor, whether contemporary or formal. Mounted at the bottom and top of the window frame, these sophisticated shades can be maneuvered into whatever configuration you want. Paired with sheer honeycomb panels, these practical and beautiful shades are the ideal solution for master bathrooms or any other room where you want to regulate privacy. The honeycomb cells compress or stretch to allow either panel to fill the window frame. Find the perfect color to match your décor. 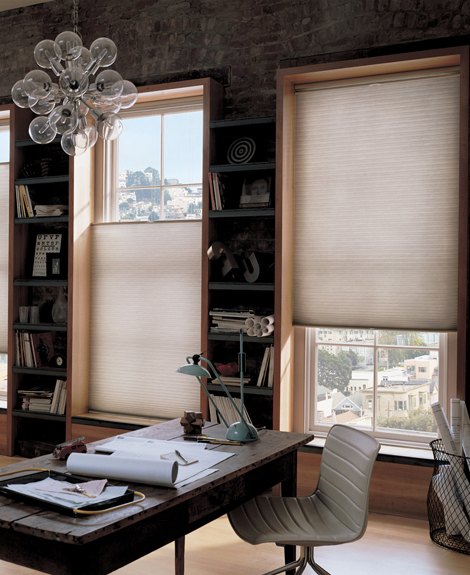 Sleek and sophisticated, these honeycomb shades can be custom made to fit any size window. The crisp pleats offer an exquisitely modern look while also being very energy efficient by blocking solar heat and adding insulation. 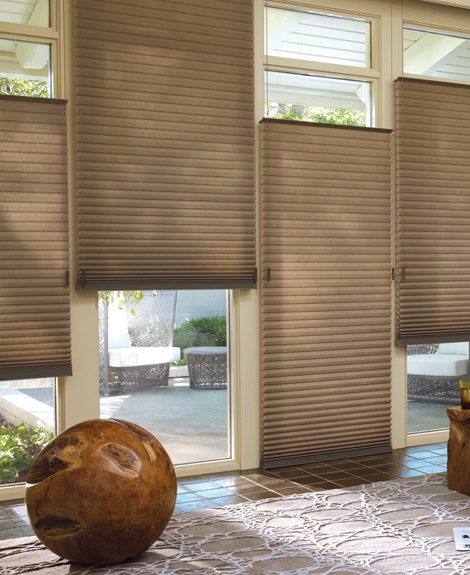 Because the pleats compress to just a few inches, these shades will never block your stunning view. 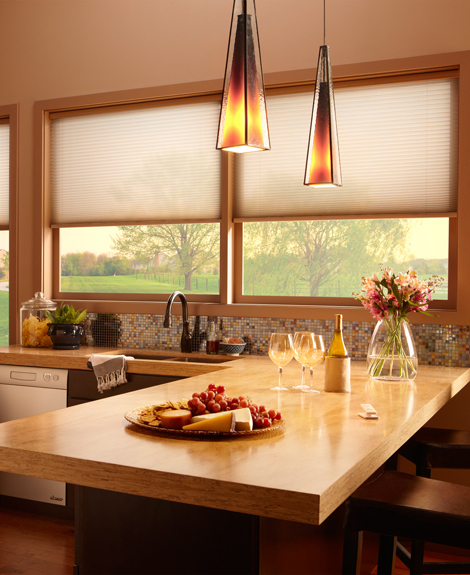 Honeycomb shades enhance the décor of any room – even kitchens. Designed to be as functional as they are beautiful, these shades offer a variety of hardware systems such as low profile rails and motorized options. Colors can be chosen to blend with the wall color or to match specific furnishings in the room. 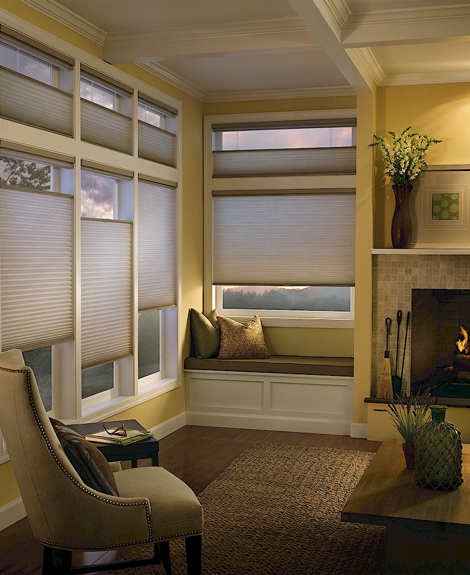 These honeycomb shades create a calm and elegant ambiance in this traditional sitting room. Matching the rug and furniture, the tan shades block the midday sun and keep the room from overheating. Mounted at the top and bottom of the window frame, shades can be raised or lowered to give you a variety of looks. 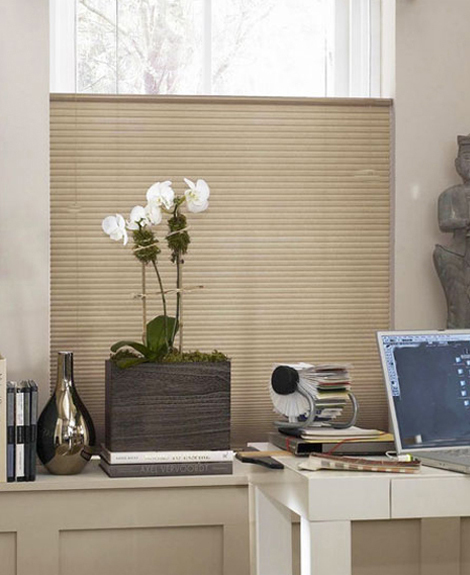 Perfect for your home office, honeycomb shades come in a variety of luminous colors and designs. Sheer enough to let in light yet opaque enough to offer privacy, you can sit at your desk and not feel like you are on display. In addition, the sleek look won't interfere with any of your decorating choices. Cover an entire wall of windows without overpowering the room with loud colors and busy patterns. 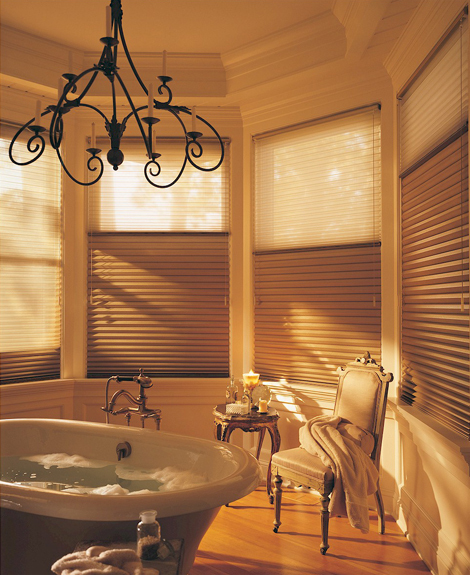 Honeycomb shades offer the perfect solution to problem rooms that complicate decorating with a variety of windows in various sizes. Honeycombs in soft colors will blend with the walls and fit perfectly with any décor, from modern to classic. 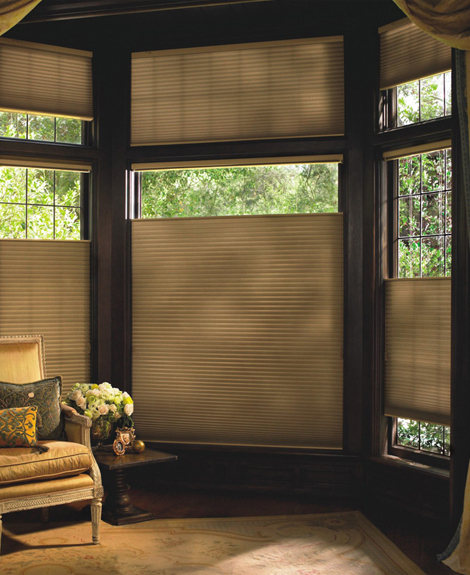 With their cell-like design, honeycomb shades can stand alone with their sophisticated style and variety of colors without needing any other fabric window treatments to complement them. Used in every area of the house from offices to bedrooms to kitchens, these shades both match and blend with all décor styles. 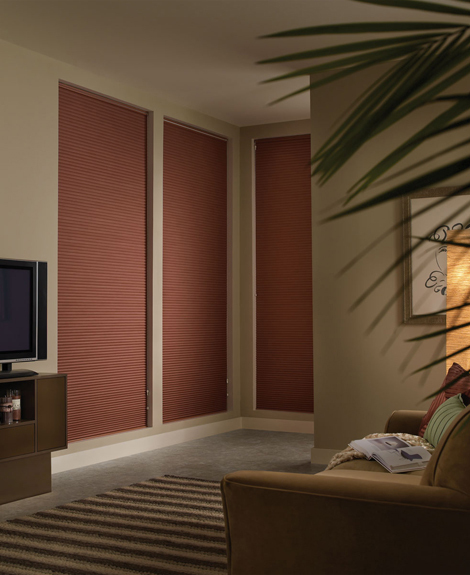 Don't forget to add a pop of color to your room's décor with honeycomb shades. Custom fitted and sophisticated, these shades are an elegant way to add either subtle or vibrant color to any room. Complete the look by installing a valance above to create a touch of pattern and softness.